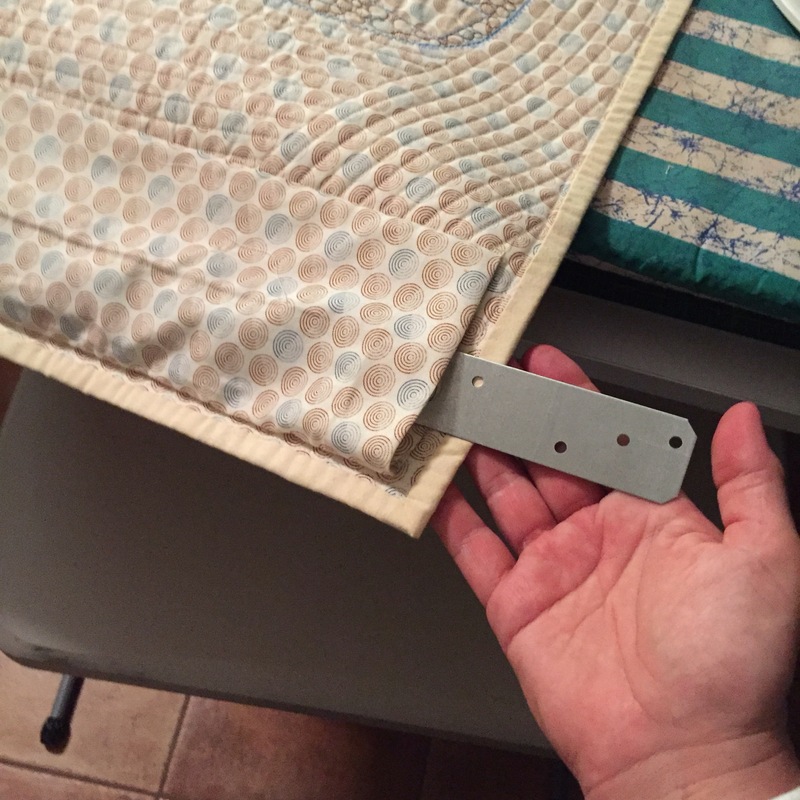 Using inexpensive metal straps and plates from the hardware store with neodymium magnets makes a quilt safe hanging method. Deciding to change the art quilt on my wall pretty often, I realized that a traditional nail wasn’t going to cut it. My quilts have variable sizes and weights. I got the idea for this setup from my magnetic name badge. Surfing my favorite magnet website, I found that there are magnets strong enough to even hang a regular quilt. Hardware for flat hanging art quilts. Tie plates, tie straps, command strips, neodymium magnets. Neodymium magnets are very strong, and have a polished clean finish. Magnets strong enough to hang a bed quilt should be used with caution. Their strength could damage your fingers if your fingers or skin got slammed in between them. For my test, I am hanging a 24×24 art quilt. I wanted temporary but strong and reliable setup so chose 3M command strips of the strongest I could find. My local home depot had 16 lb velcro sets for hanging framed pictures. I used 1 13/16 in x 5 in tie plates (found in the lumber department in the structural straps section), and I also bought a variety of 20 guage strap ties in various lengths. 18 Guage would work too. But keep mind that there is a tradeoff in how strong a magnet sticks (thicker metal or more iron in the metal) versus weight of the metal. These bars will not sag because they will be oriented flat to the wall. 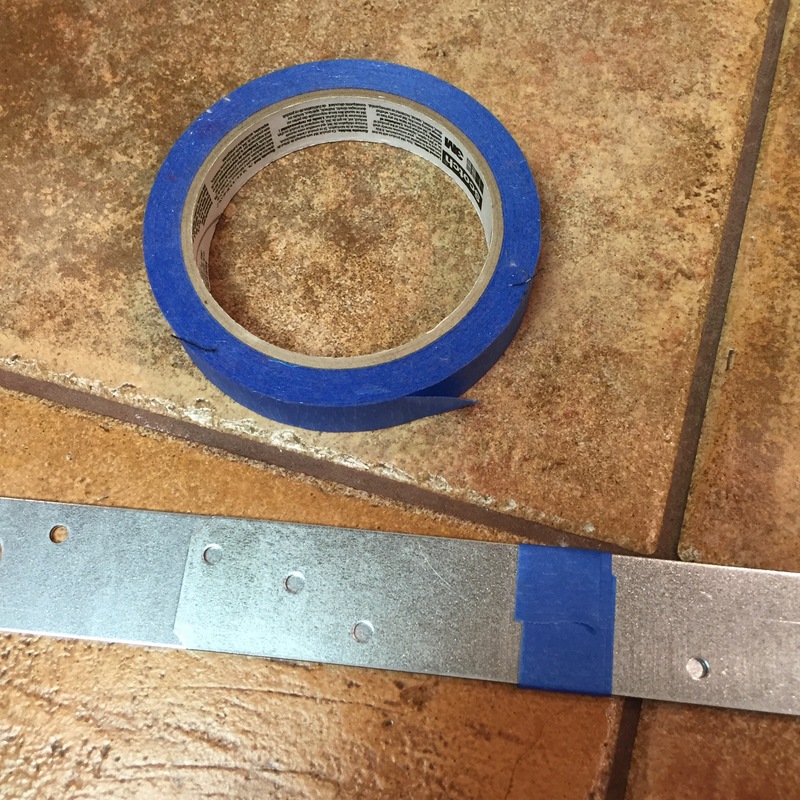 Use tape to overlap the straps and secure them to each other. Use enough straps to fit behind the quilt back. I overlapped two flat metal bars so they were long enough to fill the entire quilt sleeve but not stick out beyond the quilt. I put the command strips on the small tie plates. This size, five inches long, give enough surface room for the long command strips. The tie plates are then fixed to the wall and I allowed them to adhere for an hour to allow the command strip adhesive to develop full strength. I checked the width of the quilt back and made sure the tie plates were hidden behind the quilt. Put a magnet on the top of the tie plate. Testing the setup. Velcro command strips can support quite a lot of weight. I chose strips that will support 16 lbs. The horizontal bar will go inside the quilt sleeve. I slid my assembled strap into the quilt sleeve and set it against the magnets. it was super easy to adjust the level. And it will be super easy to add length and tie plates with magnets. The result is a super flat against the wall hanging arrangement that fully supports the quilt without pinching, compressing, or putting holes (pins or tacks) in your quilt. I believe this is my hanging method of choice from now on! “Turning Over a New Leaf” art quilt by Suzan Engler. Suzan made this quilt for the Ovarian Cancer Awareness Quilt Project. Auctioned in 2014, the quilt raised money for Ovarian Cancer Research at MD Anderson.